Barrys fit and Micahs alright now i think. Silva will miss tomorrows game and Ajax but Mancini is hopeful he'll be back next weekend. I do hope so, I like to think he was one of the reasons we were so poor last night. For David Silva there is little left to achieve in football. At 26 years of age the Manchester City playmaker is the x-factor in Roberto Mancini's team and a star in a Spain constellation that is surely the brightest ever to light the international stage. He has won the World Cup and two European Championships, opening the scoring in this summer's 4-0 demolition of Italy in the Euro 2012 final before being named in the tournament's best XI by Uefa. And yet the Premier League's most decorated player, as hungry as ever, believes retaining the title this season would rank alongside all those outstanding feats. In person, David Josué Jiménez Silva seems even slighter than he does at a distance on the pitch. When we meet he is sporting a shaggy beard and offers a forthright view. On helping City in their attempt to become only the third club after Manchester United and Chelsea to claim consecutive Premier Leagues, Silva says: "It would be right up there with all the other big competitions that I've won. Winning the Premier League is seen as a big thing. It would be a great achievement to retain it. I've been lucky I've won a lot of medals but I'd still like to win more." Silva admits that securing a first league championship for the Blues since 1968 may have taken the edge off so far. "You don't have the pressure anymore to win because you have won it, perhaps," he says. "The players do have the hunger to win it again so we'll go for it." Is keeping grasp of the crown proving harder than the midfielder thought? "It is a difficult thing to achieve but certainly there's still a long way to go and we'll keep at it to win it again," he concurs. Silva is relaxed that the group led by Yaya Touré, Sergio Agüero, Carlos Tevez and himself is yet to really fire this season, and he believes the Sheikh Mansour project is firmly en route to becoming the English game's Barcelona. The recent arrival of Ferran Soriano, the chief executive, and Txiki Begiristain, the director of football, each of whom previously held the same positions at the Catalan club, prompts Silva to say of his countrymen: "They were part of a club which won every title there was to win in both Spain and in Europe. They were part of a very successful era at Barcelona. "Hopefully that's what they are bringing here and we can do something similar. We hope one day we'll be able to be a club that is talked about like Barcelona. It's hard to say we're close to that because, although we won the Premier League, we went out of the Champions League, but it's a question of working at it and trying to make more of an impact in Europe." Silva's trophy count stands at the 2010 World Cup, the 2008 and 2012 European Championships, the FA Cup and Premier League, plus the 2004 European Under-19 Championship. But there will be no chance in this campaign of completing this glittering collection of major medals with the Champions League, after City were dumped from European football when finishing bottom of their group. "I can't put my finger on what it was," he says. "All I can say is when I came to City they were looking to get in the top four, since then they have won the Premier League, the FA Cup, we have qualified for the Champions League and people can't expect to win the Champions League straight away. We've got very good players and we will get there. I wish to win it with City but one step at a time." Sunday's last gasp 3-2 derby defeat to Manchester United has left them six points behind the 19-times champions. City lost to United after a spirited comeback from 2-0 down, before Robin van Persie's 90th-minute free-kick claimed the victory for the red half of the city. Silva places it in context: "Yes it was three points lost but there is still a long way to go, the disappointment is over with – we need to keep going." The prerequisite for all champions is the refusal to cave in, so City's equaliser with only three minutes remaining was pleasing. "The fact is that this season we have done that, come back in the second half, the team know how to react, which is good," he says. As expected, Silva absolves Samir Nasri, whose half-turn in the City wall allowed Van Persie's shot to deflect in. "I don't think that was why we lost," he says. "You can have one person in the wall and they hit it into the stand or you can line up five and they put it in the top corner. It was just one of those things, we don't blame him." The big issue in City's title defence has been too many draws – six to United's none – with Sunday their first defeat. Silva says: "You can always improve, but each game has its own circumstances and I'm sure we will improve and get back to our normal self. Six points is a gap, it is a big gap. But last year we saw how they were in front by quite a lot of points [eight] and we won the league anyway. It can be done." City preceded the derby loss with the 1-0 Champions League reverse at Borussia Dortmund that confirmed there will not even be Europa League football at Eastlands in the new year and led to severe criticism of manager Roberto Mancini. Do the players think this is fair? "We're responsible for what has happened," he says. "The way we played in the Champions League – we all have to take the blame for that. It didn't start well in the Champions League and it became an uphill task. But you can't just blame the manager." Is Mancini still the man to move City forward? "All I would say is that since I joined City up to now we have made progress with Roberto. All there has been is progress." They travel to Newcastle United on Saturday looking to avoid a third consecutive defeat in all competitions. There are fond recollections, however, of their last visit to St James' Park when, in the penultimate outing of the title chase, Mancini pushed Yaya Touré forward and the Ivorian scored twice to set up a breathless final day which climaxed with Agüero's championship winner in the 3-2 victory over Queens Park Rangers. "There are good memories from last season. It's always a difficult place to go and play but hopefully we will get the same memories this year," says Silva, before declaring himself happy with his own form since recovering from a hamstring strain last month. "I'm feeling great again. Before the injury I was good, I was playing very good – I had three weeks out but now I can hopefully keep going that way." Silva was the player of the first half of last season, living up to the "Merlin" nickname he was given by Shaun Wright-Phillips shortly after he joined the club. But in a post-Christmas dip, his uneven performances were reflected in him managing only one more league goal that season, with his opener in the 5-0 rout of Aston Villa in November only a second of 2012. 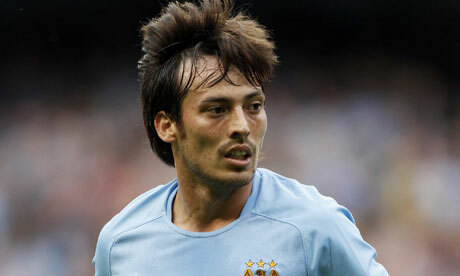 Mancini has said that the amount of football Silva has played is a factor in these fluctuations. "It is true I have played a lot of games in the last three or four seasons with the European Championships and World Cup and league," Silva says. "But you have to recover well after every game and just be there: that's football and that's the way it is." Another issue is the ankle injury that Silva has to manage. "Yes, I do have to keep on top of it, always work on it and constantly care for it and there are parts of the season where I have to look after it a bit more, but it's OK."
Would, then, Silva one day like to return to play in Spain, where the game is considered less physically imposing? "I'm very happy at City at the moment," he says. "I've no plans to move back but you never know what might happen in the future." For now City need him: when he plays well, so does the team. The second half of the season could be his time. David Silva hasn’t completely ruled out making the FA Cup semi-final against Chelsea, though he admits the clock is ticking against him. The Blues’ playmaker was in superb form against Manchester United on Monday evening but pulled up with a tight hamstring in the closing stages and must be rated as doubtful for Sunday. Silva, however, hasn’t given up hope. “I’m having tests today and we will see,” he said. “The tests will confirm whether I will be able to play or not. “I can still feel the injury so I have to wait to see what the tests show, but hopefully I will recover enough to travel with the squad. It would be a big blow for me to miss the semi-final because it’s a game every player wants to play in. If I can’t play, there’s always a strong replacement that can come in for me but let’s see how things pan out. If Silva does miss out, it will deny the millions around the world the opportunity to watch him go head-to-head with his international team-mate Juan Mata in a duel of two of the best play-makers in Europe. David is already looking beyond the FA Cup and ahead to City returning stronger and more experienced in next season’s title race. The Spaniard admits the standards set in the 2-1 win over United must become the norm if the Blues are to ensure the title challenge is more sustained than it has been this campaign. “To win the title next year we have to show the fight we showed at Old Trafford and also last year we had that little bit of luck at the right time. We haven’t had much luck this year, but hopefully we will next time. “United have done very well but we now have to concentrate on the teams coming from behind who are playing well and finish as strongly as we can this season. I feel I’ve had a good season, again I feel we’ve not had the luck but there’s still the FA Cup which I hope we can win. “We are growing every year as a club. With the new contract for Yaya for example, it shows how we’re growing and building for the future and it’s always exciting when we are linked with new players. SilvaAccording to the RFEF (Royal Football Federation), Silva experienced slight discomfort in his hamstring following the team’s training on Sunday afternoon at the Las Rozas training facility. Silva was granted permission to leave the camp and will likely head to Manchester to continue his treatment, while Spanish national team manager, Vicente Del Bosque has ruled out the possibility of calling anyone else up for Tuesday’s friendly to replace Silva or Real Madrid midfielder, Isco, who also suffered an ankle injury and was forced to leave the camp to return to Madrid for treatment. He belongs to Manchester City. Out for a month? That is a blow. We seem to have a lot of muscle injuries. Is it just that I don't really pay attention to other teams or de we have a disproportionate number? Who has time/interest to pay attention to other teams?! He's too angry with God to reply. Few reports he has signed for fenebache..
David Silva puts out official statement on his personal situation. Hope the little fella makes it through this tough time. Aye, had been wondering what the personal reasons had been, hope it pans out ok for him and his family.